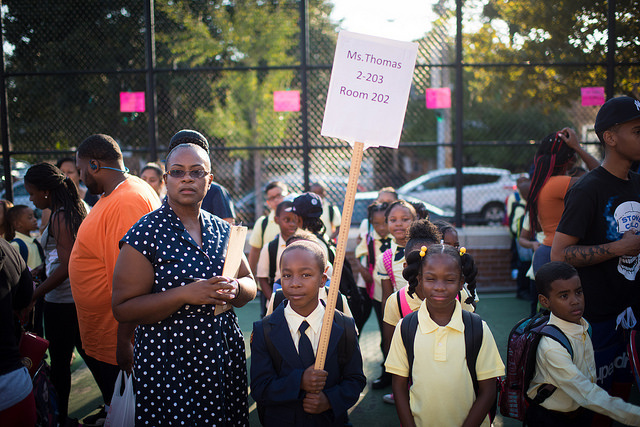 In New York City, nearly half of elementary school children are overweight. The city’s Department of Education is in charge of the largest school food service program in the country, serving over 177 million meals per year. But despite the city’s efforts, such as providing free breakfast for students and placing restrictions on snacks sold in school vending machines, childhood obesity continues to pose a major challenge. In recent decades there have been significant improvements in the quality of school food, but the need for more progress is evident -- both for the general physical health of young people and the effects it has on learning. There have been efforts in New York City to see implementation of universal free school lunch to help ensure every student eats during the day, to improve the healthfulness of the food that is offered in schools, to make sure that students have access to healthy snacks, and to allow students to eat “breakfast after the bell” inside their classrooms, not just the cafeteria before school begins. These initiatives have been implemented to varying degrees. Still, school meals are not the only contributor to children’s eating habits — many schools are surrounded by fast food restaurants and small corner markets, which children are likely to frequent before or after school hours, and sometimes during lunch breaks. Various solutions have been suggested to decrease the density of fast food outlets near schools, including zoning and conditional licensing. Some establishments selling fast food also receive subsidies from the city, which some believe should be directed at healthy food retailers instead. In New York City, the availability of healthy food options is often related to income. In low-income neighborhoods such as East Harlem, grocery stores are scarce compared to bodegas and fast food retailers. The same inequality goes for schools, where children coming from food-insecure families rely heavily on the school meals. But, despite being eligible for a reduced-priced or free school meal, the fear of stigma for being poor leads some students to skip meals. This has been part of the argument behind universal free school lunch, a program that the administration of Mayor Bill de Blasio has not agreed to, though a middle-school pilot program is underway. “The three-tier system stigmatizes students who eat free or reduced-priced meals. The system creates conditions in which some students can look down on others,” said Janet Poppendieck, the author of “Free for All: Fixing School Food in America” and senior faculty fellow at the CUNY Urban Food Policy Institute, at a food policy event at CUNY School for Public Health. Poppendieck also said that despite the changes that some schools have made to protect the identity of those who receive school lunch assistance, the stigma around those students still persists. Some students wind up skipping what might be their only potential proper meal of their day. Poppendieck is also part of an advocacy campaign called Lunch4Learning (L4L) that is behind the push to make free school lunch universal. L4L and other advocacy groups recently rallied at City Hall to demand Mayor de Blasio keep his campaign promise of ending the relationship between school lunch and family income. Public Advocate Letitia James has been supportive of the recommendation, as have several City Council members. Three prominent union leaders, including the teachers union president, wrote a joint op-ed on Monday in The Daily News pushing Mayor de Blasio to include universal free lunch in his upcoming budget. Advocates say that in other cities where school districts have implemented universal free lunch, there have been positive results and more investment into fresh and local food. “So that’s why I think even for people whose primary concern is the food quality and healthfulness, nutrition, rather than the experience of the kids or the participation rate, it’s still a pathway to better school food,” Poppendieck said. Nutrition value of school meals has been a concern for a long time. A recent study conducted on Finnish 6-8-year-old elementary school students suggested that there is a positive correlation between a healthy nutritious diet and reading skills. Since a school meal might be a student’s only full meal of the day, advocates and health experts want to make sure that meals provide as much nutritional value as possible. The New York City Department of Education’s website states its “nutrition standards always meet, and many times exceed, USDA Nutrition Standards for School Meals.” These standards allow schools to serve meals headlined by pizza, cheeseburgers, chicken tenders and mozzarella sticks. The “Eat Your Colors” part of the meal is usually a healthy vegetable, like broccoli, but sometimes also french fries or another starch. Salad bar with fresh vegetables is available everyday to students across the city. “If you want paying kids to buy the food, the feeling has been that you have to offer foods that they are familiar with and recognize, and that’s...your tacos, burritos, burgers and pizzas and what have you,” said Poppendieck. “If you move to universal, you could gradually shift to include more soups and stews, which, among other things, make it possible to use leftovers." Beyond formal meals, there are often school vending machines for student use, and they regularly offer so-called “copycat products”, which are usually lower fat and lower sodium versions of popular junk food snacks such as Doritos. A UConn Rudd Center study showed that the similar packaging of these products was confusing to children and parents alike, and that many struggled to differentiate the original product from the healthier one. The study reasons that selling these products contradicts the schools’ nutrition and health education and may fuel the misconceptions many of the participants had about the healthiness of the products. Of note are a couple other positive developments in the healthfulness of school food: food additives such as artificial colors or flavors are no longer used in city school meals and in fiscal year 2015 DOE spent 6% more of its budget on local products than the year before. Locally sourced and produced food is offered on the menu every Thursday. There is still much more to do, both in and near schools, though, to improve healthfulness for young people in New York. Some want to see the city take new steps to use legislative tools. Food insecurity and food access are major problems in many neighborhoods. According to the 2015 Food Metrics Report nearly one in five children in New York City live in food insecure households. Grocery stores are often scarce in the city, especially in lower-income neighborhoods, which makes access to fresh and healthy food challenging. Fast food outlets, however, are abundant in almost every neighborhood. According to a plan from The National Policy and Legal Analysis Network to Prevent Childhood Obesity (NPLAN), Model Healthy Food Zone Ordinance, a study showed that students with fast food restaurants within a half-mile of their school are more likely to be overweight. Another way to prevent students from eating unhealthy food during or after school hours might lie in the use of zoning. By creating so-called “healthy food zones,” fast food and chain restaurants can be prohibited from establishing new outlets within a certain distance from a school. The zoning approach is preventative, but in New York City it is nearly impossible to find neighborhoods without existing fast food outlets. Zoning may help limit new unhealthy or less healthy options from moving in, though. This practice is not currently in use. Conditional licensing can be used to restrict the operation of already existing establishments, and might therefore be a better option than restrictive zoning for urban centers like New York City. “Licensing is more flexible because you can apply it to businesses that already exist,” said Jennifer Pomeranz, Clinical Assistant Professor at College of Global Public Health. “You could use this authority to license restaurants and also stores that are near schools to say ‘you have a license to operate as long as you agree to our conditions,’ for example not selling sugary beverages,” Pomeranz said. This method would allow existing establishments to continue their operations with a healthier agenda, whereas zoning would be used to prohibit these establishments from operating in a certain area. To help retailers improve healthy food access, the city launched a program called Food Retail Expansion to Support Health (FRESH) in 2009 to provide “zoning and financial incentives to promote the establishment and retention of neighborhood grocery stores in underserved communities throughout the five boroughs.” For eligible operators, FRESH offers additional development rights, reduction in required parking, and permission for larger stores to operate in light manufacturing districts. The financial incentives include real estate tax reductions, sales tax exemption, and mortgage recording tax deferral. 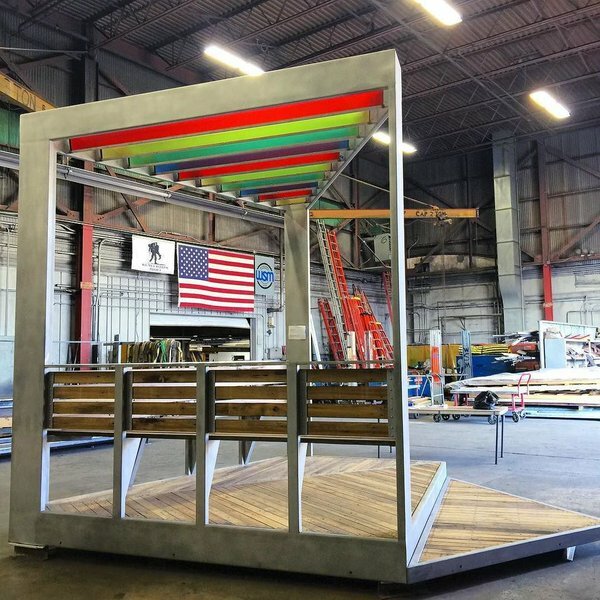 These make it easier for new retailers to open a new grocery store in underserved areas and for existing businesses to stay in operation. The city has also moved forward with the green carts initiative, providing more options for healthy food in underserved neighborhoods without the major capital and overhead costs of a traditional store or restaurant. A move to replace fast food outlets with healthier retailers would meet strong resistance. The fast food industry’s lobbying powers have regularly made sure that efforts to limit its operations are defeated. For example, in 2014 the city lost its battle to limit the sizes of sugary beverages that could be sold in certain circumstances -- an effort started by former Mayor Michael Bloomberg, who has backed regulation of sugary beverages around the country. In New York, there was strong pushback from both the public and the restaurant industry. Changes in food options for students rely on viable alternatives to unhealthy options now being offered, and where the city has the most control is indeed in schools themselves. On Tuesday, the New York City Council announced $595,000 in funding for 16 new school food pantries across the city. The pantries, which will be placed in high-needs schools in partnership with Food Bank for New York City, are largely aimed at “combating food insecurity,” according to a press release from the Council. They will offer food that can be taken home as well as personal hygiene products like toothpaste and tampons. De Blasio has sought and embraced the support, frequently engaging with AARP members and regularly citing AARP's endorsement as validation for his housing plan, specifically controversial changes to the city's zoning rules that he is negotiating through the City Council. On Tuesday, the Council will pass changes to the zoning code that AARP supports as essential to creating more affordable housing for seniors. Not only is AARP helpful in the near-term as de Blasio builds support for his policies, but older voters are also an important bloc as de Blasio heads toward a 2017 re-election bid. There are more than 2 million registered voters in New York City over the age of 50, which is the threshold for AARP membership, and 72 percent, or 1.5 million, are Democrats, according to Steve Romalewski, Director of CUNY Mapping Service at the Center for Urban Research/The Graduate Center. Older people are known to vote in higher percentages than other age groups, and that is the case in New York City. According to Romalewski, in the 2013 mayoral election, which saw very low overall turnout as de Blasio cruised to a landslide, about 38% of the one million-plus registered voters 65 and older voted, compared to 12% of the one million-plus registered voters 35 or younger. While AARP has become a key ally for the mayor, the group does not officially endorse candidates. Still, de Blasio's attention to issues of concern for older people and their regular exposure to him as a champion of their causes certainly appear to have created a mutually beneficial dynamic. AARP support for de Blasio's zoning changes became loud during a tough time for the mayor as community boards and others around the city criticized the plan. On Monday evening, de Blasio held his fourth tele-town hall with AARP-NY in the last nine months, during which he has discussed affordable housing and other issues with thousands of older constituents. According to AARP, 12,800 people participated over the course of an hour-long tele-town hall in February. During Monday's call, de Blasio struck a celebratory tone on the eve of the City Council voting through the zoning changes. Saying that Tuesday is "going to be a great day for New York City," de Blasio thanked AARP members for "the decisive support you have provided for our affordable housing plan." The "historic" day, de Blasio said, will usher in new policies "to open up a lot of different places where we can create the affordable housing seniors need." De Blasio told call participants that there will be a celebratory rally in Foley Square at 5 p.m. on Wednesday. Over the past two months, AARP also figured significantly in two de Blasio-led rallies at City Hall - one on his housing policies, one on his new retirement savings plan - and helped coordinate an in-person town hall meeting de Blasio held on senior housing in Manhattan. "AARP is an extraordinary force for good," de Blasio said during one of the tele-town halls, "looking out for the needs of our seniors, making sure their rights are respected, and building a more fair society." In response to de Blasio's affordable housing plans outlined in his 2015 State of the City speech, AARP New York State Director Beth Finkel said in a statement, "Mayor de Blasio outlined a bold initiative to help make New York City more affordable...AARP looks forward to working with Mayor de Blasio and the City Council to address a primary concern of so many New Yorkers - the cost of living here - and continuing to make New York a great place to live, work and play for all age groups." In a Friday interview with WNYC, de Blasio said that as he and his administration engaged more people on his zoning proposals and larger housing plan, more came to support it. 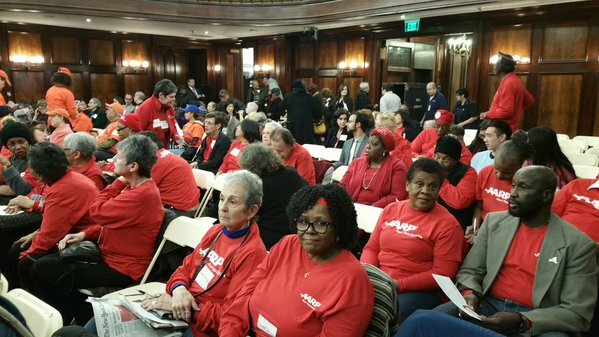 "[A]s this legislation moved forward," de Blasio told WNYC's Brigid Bergin, "crucial organizations like AARP got involved and they spoke powerfully to seniors about why this would help create more senior housing. And that brought in a lot of support." He also referenced the support of a variety of labor unions. A nonpartisan advocacy group, AARP does not endorse candidates or make campaign contributions. It does, however, support policies, and it has put significant resources behind de Blasio's zoning changes. AARP has also committed to full-throated support for the retirement savings program, which the group's representatives say is a major national priority. Still, AARP representatives are firm that the organization does not endorse, donate to campaigns, or promote candidates through independent expenditures. In response to a tweet from Gotham Gazette in which this reporter speculated that AARP could be a formidable source of election support for de Blasio, AARP Associate State Director for New York City Chris Widelo tweeted back, "we are strictly non-partisan and do not endorse...but our members do vote!" During a phone interview Monday afternoon, Widelo explained more about AARP's approach to issue advocacy versus candidate campaigns. "If it were an election, I think our tone would be different," Widelo said. He added that AARP has been behind the mayor's housing plan with such energy because it is a key priority, but he stressed that the organization will not be supporting de Blasio's reelection campaign. "Next year, you'll probably notice AARP, we have a hard deadline when candidates file paperwork and become a candidate in our eyes, even if they are a sitting elected official, and we adjust how we may coordinate." Widelo said that the deadline is in the summer, but that AARP will judge the political landscape. AARP has also done tele-town halls with Governor Andrew Cuomo and Public Advocate Letitia James, Widelo noted. "It just so happens that our priorities have lined up with the mayor's and others here in the city," Widelo said. "We're happy to have the mayor of the largest city in the country on our tele-town hall, for sure," he added, "but for us, it's more important to tell [members] the story about what this policy is...it's educational." While AARP is appreciative of the mayor's attention to issues older New Yorkers care about, de Blasio is certainly happy to have the group's support. At a March 9 rally outside City Hall to support his housing agenda, de Blasio was surrounded by representatives from AARP and several labor unions, each of which he thanked. "I have to say, there are so many great organizations," de Blasio yelled through a megaphone, "but one that has done absolutely awesome work has been AARP." Sources familiar with negotiations say that some details are still being worked through, but that the major tenets of the controversial changes to city zoning text are all but set. A deal may be announced as early as Monday afternoon. With several alterations to the original proposals by the de Blasio administration, the Council is likely to vote Mandatory Inclusionary Housing (MIH) and Zoning for Quality and Affordability (ZQA) through committee this week. Then, the City Planning Commission will be asked to sign off on the changes to the plans that it passed earlier this year, stamping them as "within scope" and sending them back to the Council for a full vote on March 22. Council votes in the zoning subcommittee and land use committee are likely to take place on Wednesday, though they could be moved if deemed necessary. But, indications are that discussions between de Blasio administration and City Council representatives are close to finalized. In news that signaled the end of what has at times been a contentious process, the de Blasio administration announced on Sunday that the coalition making the most noise in opposition to the structure of the plans had come around in support given new developments. Most importantly, de Blasio will see his Mandatory Inclusionary Housing program enacted; the plan requires that real estate developers who receive an upzoning on a plot of land in order to build more housing than otherwise allowed will have to include a set percentage of units under specific rent thresholds. Negotiating parties are making slight but important changes to the structure of affordability levels within MIH, including set-asides for lower income earners than the plan had previously included. With a series of recent endorsements and now the backing of Real Affordability for All (RAFA), a collection of community groups and construction unions, along with prior support from a variety of advocacy groups and other unions, de Blasio is set for a big-tent win. The City Council Speaker, Melissa Mark-Viverito, and Council members will also tout the new land use policies as major progress for the city, especially those in danger of being priced out of an increasingly expensive New York. Council negotiations with the de Blasio administration have centered on affordability levels, with the Council apparently able to move the needle in slight, but significant ways. The two zoning changes are part of the administration's larger housing plan, which aims to build or preserve 200,000 units of affordable housing over ten years. Forty-thousand were secured during de Blasio's first two years in office. "We're on the verge of implementing the strongest, most progressive requirement for affordable housing of any city in the country," said de Blasio spokesperson Wiley Norvell in a Sunday statement announcing the backing of RAFA. "We welcome this support, and look forward to working with communities across the city to identify even more tools to reach New Yorkers with quality jobs and affordable housing." The backing from RAFA, which is spearheaded by New York Communities for Change, an organization at one point led by a longtime friend of de Blasio, Jon Kest, who passed away in 2012, comes after concessions by the administration. Not only has RAFA seen encouraging movement on affordability levels within MIH, but the administration also promised to conduct a study of tools it can use to deepen affordability and ensure "job standards in new housing." The coalition, especially its labor component, has been calling for both local hiring and construction safety precautions to be included in the plans. The affordability levels within MIH have been the source of perhaps the most debate as the zoning amendments have gone through the public review process. Along with Mark-Viverito and Council staff, Council Member Donovan Richards, chair of the Council's zoning subcommittee, has been key in the negotiations. Council Member Jumaane Williams, chair of the housing committee, has been said to be the loudest voice pushing for deeper levels of affordability. It appears that in the final MIH structure, shifts will have been made to ensure some apartments for lower income earners and broader economic diversity within new developments. Income levels are based on Area Median Income, currently $77,688 for a family of three. AMI is a federal measure that for New York City also includes data from surrounding suburban counties. Average incomes in the city are significantly lower, especially in neighborhoods the de Blasio administration is targeting for added housing density and community improvements. "Affordable" means that a family would not be spending more than 30 percent of its income on rent. Throughout the public review process, fears of gentrification have been at the forefront. De Blasio, his representatives, and his allies argue that without a new program from the city, gentrification will continue largely unabated as it has in many communities over the past two decades. Some advocates and politicians have been calling for a mandatory inclusionary housing program for many years. As de Blasio moved forward with his plan, the big question became the exact numbers. > 30 percent of units affordable to tenants making an average of 120 percent AMI - this third option would not come with added city subsidies; would not be available in most of Manhattan in an effort to create more economic diversity; and is often known as "the workforce" option, meaning that it is targeted more at middle-class households. Negotiations appear to be yielding a couple of changes to that structure. One change is that instead of simply requiring rents for the affordable units to average 60 or 80 or 120 percent of AMI, there would be clear set-asides for some percentage of units to be affordable for those earning down to 30 percent of AMI. Another change would add a fourth option that gets at deeper affordability, possibly accompanied by a smaller percentage of affordable units, again in an effort to make some new apartments available to tenants with lower incomes. Two sources close to negotiations confirmed the outline of these changes to Gotham Gazette. City Council members indicated they were looking for these types of tweaks during a February hearing on MIH, as did Council Member Donovan Richards, chair of the zoning subcommittee and one of the Council's lead negotiators on the subject, in an interview with Gotham Gazette. Details of the changes as part of negotiations were first reported by Politico New York earlier this month. Mark-Viverito, the Council speaker, has, like many of her members, been a supporter of the plans from the start, but also interested in making changes, especially to affordability thresholds. Council Member Williams said he knows Mark-Viverito and Council Member Richards have been negotiating those numbers. "The speaker and Donovan Richards are in there trying to push what many of us are asking for," Williams said in an interview on Friday. "All of New York has to see itself in this plan. If it doesn't, we haven't achieved what we need to achieve." Williams referenced the push for a fourth option under MIH and the carving out of a certain percentage of units for those making the most modest incomes. "We want to make sure that there aren't parts of this city that are built with no deeply affordable units," he said. "There shouldn't be a project where some of the units aren't of the deepest affordability - 30 percent or below of AMI must be considered." Meanwhile, it is still unclear if there will be modifications around other key points of contention, such as the building of affordable units "off site," as in at a different location than new market-rate units. Council members have expressed interest in disincentivizing the practice within the MIH language, perhaps by including language requiring more affordable units if they are built away from the market-rate units. As for ZQA, which deals with a wide variety of more specific zoning rules, the parties appear to be coming to compromises around modifications to parking requirements that come with senior affordable housing and the distances in so-called transit zones. Details of the ZQA deal are said to be among those still being discussed as City Council members often have neighborhood-level concerns, especially around building heights, parking, senior housing, and retail space. Much of the discussion around ZQA has related to the ways in which it will help create more affordable housing for seniors. AARP and other advocacy groups have backed the plan, with AARP-NY dedicating significant resources in support, rallying with the mayor, and lobbying Council members. 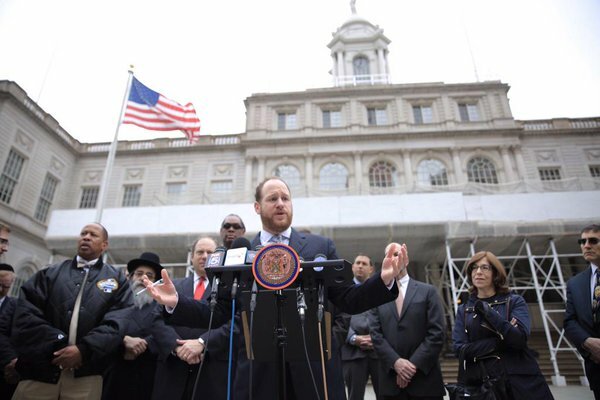 A spokesperson for Council Member Richards told Gotham Gazette that negotiations have yielded a deal on the minimum size of new affordable housing units for seniors, one point of contention in early negotiations. The de Blasio plan had put the minimum at 275 square feet, which Richards and others called too small, pushing for 400. The sides have agreed on 325 square feet. The sides are said to be negotiating specific numbers around the number of parking spots that must accompany new senior housing and which areas of the city would still require special permits to build nursing homes, among other finer points. Politico New York has reported on already-decided changes to ZQA. When a deal on MIH and ZQA is finalized, de Blasio and City Council members are likely to celebrate, these types of changes to city zoning rules do not happen often, and the mandate for affordable housing in any upzoned development is indeed a major win. How prior critics of the plans, including many local community boards who voted against their initial construction, will react is unclear. While some have seen and will continue to see merit in the plans, fears of new real estate development, added density, and rising rents are very real and unlikely to abate. The de Blasio administration is also moving forward with a series of neighborhood rezonings, starting with East New York, Brooklyn, but soon moving to communities in each borough. De Blasio is staking his legacy largely on his attempts to make the city more affordable and his housing policies will be a key piece of his 2017 reelection bid. In endorsing the mayor's plans, the New York Times editorial board recently captured the moment, writing, "This grand plan is a hugely important gamble that the city can build its way to greater housing equality, that it can ignite growth, improve neighborhoods, tame gentrification and protect tenants, all at once. 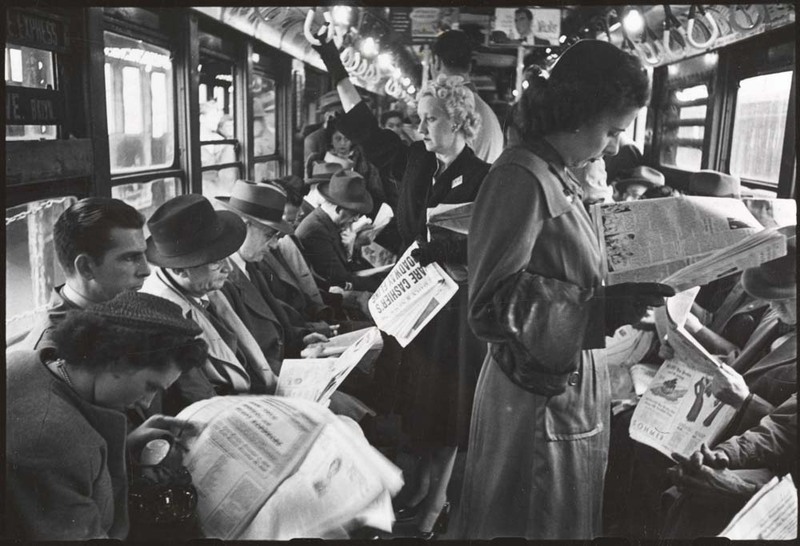 That New York can still be a mixed-income city." Passing MIH and ZQA doesn't provide the result to that gamble, it pushes more chips on the table. After a quiet Thanksgiving weekend, New York politics springs back into action Monday. As the week gets going we're watching as discussions continue around the mayor's rezoning policies, which have been seeing some significant pushback from community and borough boards. The mayor has acknowledged that pushback, saying it has not been unexpected and that tweaks will be made to the plans before they head to the City Council early in 2016. The Manhattan Borough Board votes Monday, the Brooklyn Borough Board, Tuesday (Queens and the Bronx have both voted against the plans, Staten Island has not scheduled a vote yet). Community and borough board votes are advisory. We're also watching for the latest fallout in the de Blasio-Cuomo feud, which has continued to escalate recently. It's just over a month until Governor Cuomo delivers his January 6 State of the State speech, which will outline his priorities and policy plans for 2016. After de Blasio said he couldn't wait for the state any longer and announced his own supportive housing plan, Cuomo and his team have criticized the mayor's management of the city's homelessness crisis and indicated Cuomo will include related plans in his State of the State. For his part, de Blasio has pointed to the state and the city, then under Mayor Mike Bloomberg, cutting rental subsidy programs in 2011 as integral to the increase in homelessness seen since. 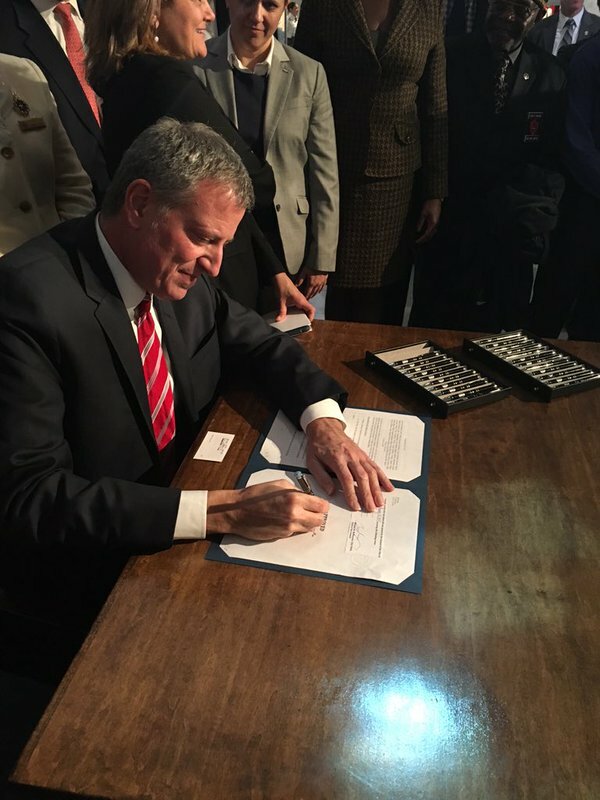 At 11 a.m. Monday, Mayor de Blasio will host a bill-signing ceremony at City Hall (details below). At 12:30 p.m., "the Mayor will deliver remarks at the Department of Transportation Recognition Ceremony for FDR re-paving crews, who are completing the first full resurfacing of the FDR since it was first built." On Tuesday, de Blasio will participate in a tele-town hall around climate change, which coincides with the Paris climate conference, at which de Blasio's recovery and resiliency director, Daniel Zarrilli, is participating. Also, Thursday is the one-year anniversary of the grand jury decision not to indict Police Officer Daniel Pantaleo in the death of Eric Garner. Black Lives Matter activists plan a series of events, "Actions will take place in Manhattan & Staten Island," according to a Facebook event page. On Monday at 9 a.m., Manhattan Borough President Gale Brewer will host a Manhattan Borough Board vote on the de Blasio administration's proposed zoning changes: Zoning for Quality & Affordability and Mandatory Inclusionary Housing. 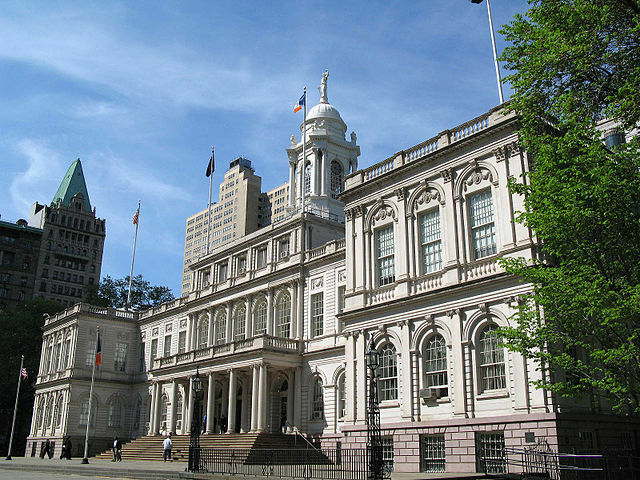 At 11 a.m. at City Hall, "Mayor de Blasio will hold public hearings for and sign Intros 898-A, 890-A, 900-A, 914-A, and 915-A, which strengthen and modify existing requirements related to open government data; Intro. 743-A, creating an Office of Labor Standards; Intro. 783-A, related to interest rates on emergency repair bills for residential buildings; Intro. 956-A, extending the Biotechnology Tax Credit; and Intro. 982-A, extending the current rate of hotel room taxes. The Mayor will also hold a public hearing for Intro. 314-A, related to establishing the Department of Veterans Services." Then, at 12:30 p.m., the Mayor will speak at the aforementioned FDR repaving ceremony. At 10 a.m. Monday, city Comptroller Scott Stringer, the Reverend Al Sharpton, Congressional Reps. Jeffries and Rangel, and Assembly Member Wright will hold a press conference announcing anti-gun violence initiatives. Monday at 10:30 a.m. at Applebee's in Times Square, city Health Commissioner Dr. Mary Bassett will make a "sodium warning label announcement." At 10 a.m., the Committee on Youth Services will hold a hearing on Introduction 554-2014, in relation to training for certain employees of the city of New York on runaway and homeless youth and sexually exploited children, and Introduction 993-2015, in relation to changing the date of an annual report related to sexually exploited children. At 10 a.m. at Johnson Community Center in Manhattan, "The Committee on Public Housing will hold an oversight hearing examining the Mayor's plan to address violent crime in public housing." City Council Speaker Mark-Viverito is set to participate. At 1 p.m., "The Committee on Recovery and Resiliency will hold an oversight hearing on the resiliency of New York City's electricity transmission and distribution systems." At 12:45 p.m. Monday, Whoopi Goldberg, George Takei, City Council Speaker Melissa Mark-Viverito, Council Member Corey Johnson, and the Council's LGBT Caucus will acknowledge this year's World AIDS Day by "flipping the switch" to light the Empire State Building in red in honor of World AIDS Day. At 6 p.m. Monday Queens Borough President Melinda Katz will host a workshop at the Queens Borough Parents Advisory Meeting about how to be more supportive of schools. On Tuesday the Brooklyn Borough Board, led by Borough President Eric Adams, will vote on the de Blasio administration's two rezoning proposals. On Tuesday at noon, Joe Domanick of John Jay College will speak about his new book Blue: The LAPD and the Battle to Redeem American Policing, which details NYPD Commissioner Bill Bratton's work transforming "the police department of America's second largest city—a period which saw Los Angeles's violent crime rate, including homicides, drop by double-digits" 2002-2009. The event is hosted by the Manhattan Institute. At the City Council on Tuesday: at 1 p.m. the Subcommittee on Planning, Dispositions and Concessions will meet. At 5:30 p.m. Tuesday, New York City Council Speaker Melissa Mark-Viverito and the City Council will host a Diwali celebration - Diwali is the Indian festival of light. At 6 p.m. Tuesday, Mayor de Blasio, City Hall representatives, and activists on climate change will take part in a tele-town hall on sustainability. Participants will include Nilda Mesa, Director, Mayor's Office of Sustainability; Bill Lipton, State Director, New York Working Families Party; and Eddie Bautista, Executive Director, NYC Environmental Justice Alliance. At 6:30 p.m. Tuesday: "Bail Reform - Federal and State Courts Wrestle with Options for Change" will be hosted by the New York City Bar's Criminal Advocacy Committee. Panelists include: Karen Friedman Agnifilo, Chief Assistant District Attorney, New York County District Attorney's Office; Elizabeth Glazer, Director, Mayor's Office of Criminal Justice; Scott Hechinger, Staff Attorney, Brooklyn Defender Services; Joan Loughnane, Chief Counsel to the United States Attorney, Southern District of New York; Jerold McElroy, Executive Director, New York City Criminal Justice Agency, Inc.; Marika Meis, Legal Director, Criminal Defense Practice, The Bronx Defenders. At 7 p.m. Tuesday, Riders Alliance will host "Discount Fares for Low-Income NYers: A Conversation." At 10 a.m. the Committee on Economic Development will meet on "Community planning boards receive an annual report submitted to the mayor with regard to projected and actual jobs created and retained in connection with projects undertaken by a certain contracted entity." At 10 a.m. the Committee on Transportation will meet to discuss a number of bills regarding bicycle safety in the city, including founding a bicycle safety task force, seizure of abandoned vehicles, and a number of bills on walking away from and not reporting incidents and accidents. At 1 p.m. the Committee on Sanitation and Solid Waste Management will meet to discuss a bill that would exempt licensed plumbers from registering with the business integrity commission. At the State Legislature on Wednesday: an 11 a.m. meeting of the Assembly Standing Committee on Correction for "Oversight and Investigations of the Department of Corrections and Community Supervision." On Wednesday at 8 a.m., City & State NY will host an event on the impact of raising the minimum wage. Speakers will include state Senator Jack M. Martins, Chair of the Labor Committee; E.J. McMahon, President at the Empire Center for Public Policy; and Hector Figueroa, President of 32BJ. On Wednesday at 6 p.m., Open Society Foundations and Vera Institute of Justice will hold "Policing and Public Health: Advancing Harm Reduction Strategies in Law Enforcement Practices," bringing together health specialists and law enforcement representatives for a discussion on how to "protect the rights and foster the health of the most vulnerable members of society." At 7 p.m. Wednesday, the Cannabis and Hemp Association will host "Open for Business," a panel discussion on the subject of medical marijuana in New York City. State Senator Diane Savino and Dr. Julie Netherland, Deputy State Director for Drug Policy, are among those who will speak. At 10 a.m., the Committee on Consumer Affairs will meet. At 1 p.m. the Committee on Mental Health, Developmental Disability, Alcoholism, Substance Abuse and Disability Services will meet for an oversight hearing on alcohol abuse in New York City. At 1 p.m. the Committee on Community Development will meet to discuss establishing an urban agriculture advisory board. At 1 p.m. the Committee on Parks and Recreation will meet: "Oversight - An Examination of the City's Parks Without Borders Initiative." At the State Legislature on Thursday: a 10 a.m. meeting of the Assembly Standing Committee on Transportation to discuss the Department of Transportation two year capital program. On Thursday the New York Justice League and Black Lives Matter will hold "#ChokeHoldOnTheCity," remembering the one-year anniversary of the decision by a Staten Island grand jury not to indict Police Officer Daniel Pantaleo in the death of Eric Garner and continuing the push for policing reform and accountability. "Actions will take place in Manhattan & Staten Island." At 4 p.m. Thursday the Center for Bronx Non-Profits and South Bronx Rising Together will host "Voter Engagement in the South Bronx," a panel discussion on non-partisan attempts to increase civic participation, a discussion of tools and ways to involve the populace in shaping policies that they feel are important. At 6:30 p.m. Thursday, New York City Comptroller Scott Stringer will host a town hall event for New Yorkers to discuss concerns and learn about what the Comptroller's Office can do to help. At the City Council on Friday: the Committee on Courts and Legal Services will meet at 1 p.m. on "Client satisfaction surveys for city-funded indigent legal services." At the State Legislature on Friday: a 10:30 a.m. hearing of the Assembly Standing Committee on Corporations, Authorities and Commissions jointly with the Assembly Standing Committee on Energy and the Assembly Subcommittee on Infrastructure to evaluate natural gas safety efforts by utilities. At noon Friday, Crain's New York Business will hold its annual "Best Places to Work in New York City Awards" luncheon. At 9 a.m. Saturday, BetaNYC will hold "Hack for Heat" in response to the fact that 230,000 heating complaints were filed by New Yorkers because their landlords would not turn on the heat. On Monday, de Blasio was asked about the largely negative reaction across the city to the zoning proposals at the center of his affordable housing plans. Many community boards are voting against the two rezoning proposals, which call for changes to how space is used, including allowing more retail and housing density as part of new development with market-rate and affordable apartments. Both the Bronx and Queens Borough Boards - made up of community board leaders, City Council members, and the borough president - have voted against them. The Brooklyn and Manhattan Borough Boards are expected to vote next week, while a Staten Island vote is not yet scheduled. De Blasio said Monday that he is "resolute," adding that he is not surprised community boards have objections. "Those objections should be heard and we should think about them," de Blasio said, "and where we see the need to make certain modifications we will." "But in the end," the mayor continued, "the community boards aren't the final decision makers. The mayor and the City Council make the decisions, in some cases, obviously, with the City Planning Commission. And that's where our process is set up, and that's how it's worked for years." What de Blasio will need, of course, is City Council buy-in. As the mayor, top administration officials, and his city planning department consider feedback from local leaders and make "modifications" to the rezoning plans, they'll need to convince Council members representing the districts set to undergo the most change that they should vote in favor of the plans. These include representatives from communities like East New York, East Harlem, Flushing, and areas of the Bronx, among others initially targeted for the zoning changes and more housing. The leader of the Council, Mark-Viverito, also happens to represent East Harlem and part of the Bronx. She abstained as the Bronx Borough Board voted against the mayor's plans and said she'll abstain when Manhattan votes on Monday, Nov. 30. While the community and borough board votes are non-binding advisory opinions, they are indicative of concerns throughout the city about de Blasio's plans. Those concerns include worries about rising prices and gentrification accompanying new development; that new housing won't be accompanied by new schools and transportation infrastructure; lack of parking; and more. 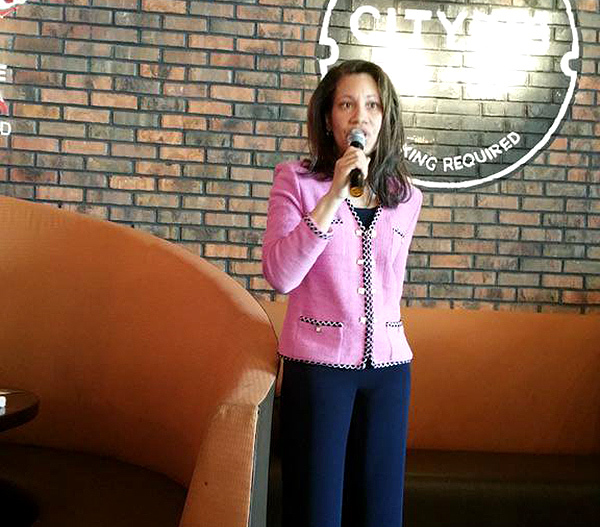 On Tuesday Mark-Viverito said that she is sure the plans will need to be changed in order to pass through the Council. Saying that Council members are listening to their constituents and that the plans will "obviously go back to City Planning," Mark-Viverito said, "The plan that has been presented originally, I can assure you, will not be stagnant and...will not be the plan that comes before us at the Council." Some of the key changes that may be made based on community pushback include creating more flexibility within the proposals for how area median income (AMI) is determined - instead of using one set of figures for the whole city as the plans do now, AMIs would be set more by local geography so that apartments being labeled as "affordable" would truly be so for local residents, especially the lowest income earners. On the other hand, in some areas of the city, residents are looking for more units to be carved out for middle-income earners. There are also historical and neighborhood preservation concerns in some places. Other possible tweaks relate to ensuring that affordable housing for seniors is made permanently so; that parking is protected; and that affordable units are required to be built among market-rate units, not off-site or even on separate floors. 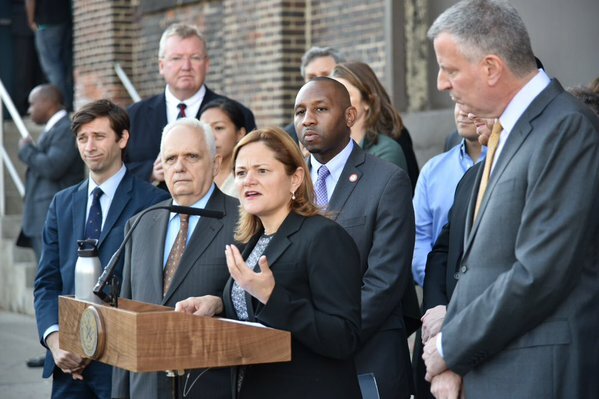 "The land-use review process is extensive," Mark-Viverito said Tuesday. When it comes to the two rezoning proposals, Mandatory Inclusionary Housing and Zoning for Quality and Affordability, the speaker said, "We're at only the beginning stages of that debate and that conversation. So yes, community boards are taking a position, some borough boards have taken positions; but we're nowhere near engaging in that level of debate at the Council level." She promised continued constituent engagement and figuring out how to "make additional improvement" to the plans. Calling some of the community concerns "legitimate," Mark-Viverito said "some communities want greater AMIs, some communities want lower AMIs. It's going to be a very, very heated conversation." For his part, the mayor said "it's all part of a democratic process," and that the community boards "inform the process." He did remind, though, that community boards are indeed advisory and that the elected officials - who often disagree with community boards - make the final decisions. "I'm listening. My whole team is listening to them," the mayor said Monday. "We're looking at if we think any of the points raised a need to make any changes." De Blasio and his team will continue to defend the plans, even if they're open to tweaks. They argue that the city desperately needs more housing, especially affordable units, which can only be built in most cases if new market-rate housing is also allowed. They also sell the plans as community development, highlighting new retail space that will created, and with it, employment and shopping opportunities. "It does have an impact on our thinking," de Blasio said of community feedback. "It does help us figure out things we need to do better."